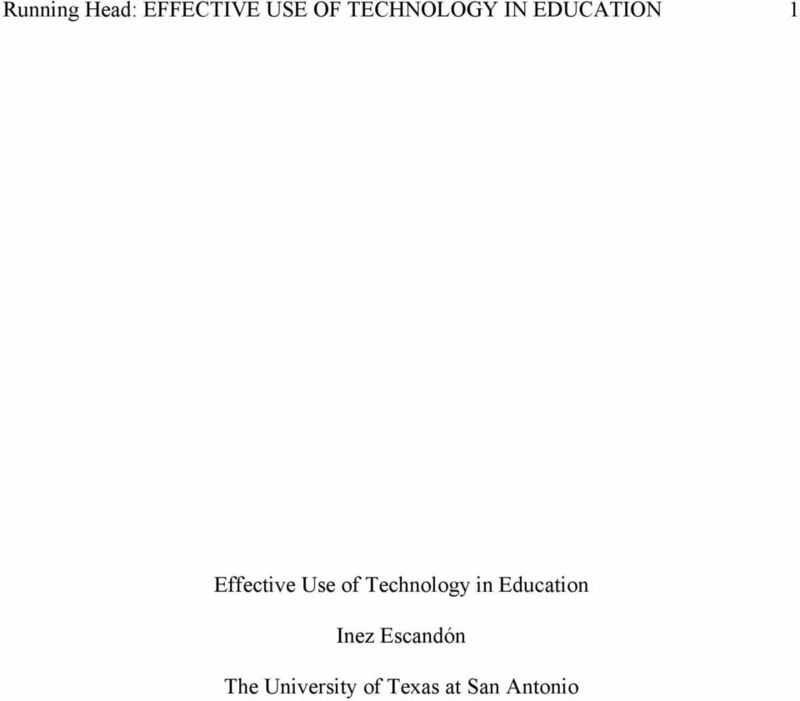 Download "Running Head: EFFECTIVE USE OF TECHNOLOGY IN EDUCATION 1"
9 EFFECTIVE USE OF TECHNOLOGY IN EDUCATION 9 the Stanford 9, positive attitudes increased within the students, and teachers really seemed to enjoy the BS/CE over time. Harold Wenglinsky analyzed simulation and higher order thinking software s impact on mathematics on thirteen thousand fourth and eighth graders in the last study. Wenglinsky found that eighth grade students who used the two technologies were fifteen weeks above grade level while the fourth grade students who used them were three to five weeks ahead. He also concluded that professional development for teachers showed gains in scores as well. Both fourth and eighth grade students performed worse on drill and practice technologies than the control group. Although these five studies had a few negative findings, Schacter (1999) concluded that educational technology is effective in increasing test scores and producing a positive learning environment. In order to use educational technology to its full potential, it is essential to consider all the important factors. Teachers must remember that there must be a balance between concrete and abstract experiences. 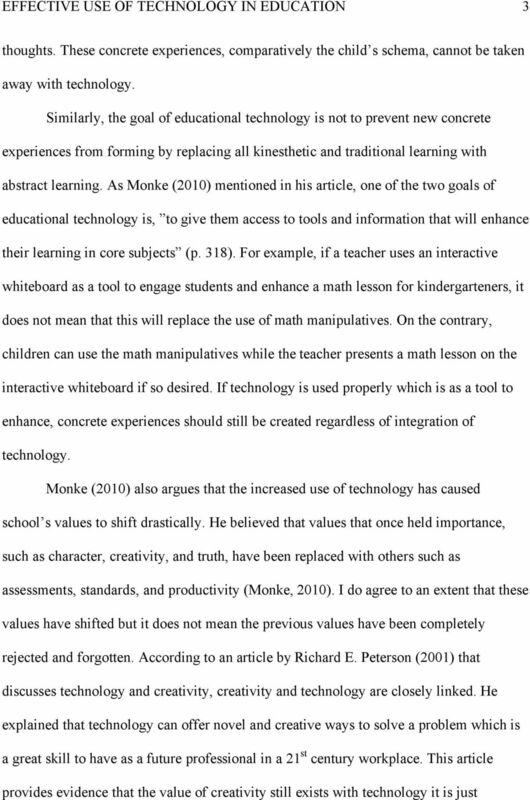 Educational technology should be used as an enhancement as opposed to a replacement. It is important to be aware of the values that are being taught and to make an effort to integrate a wide variety through the technology. Teachers must acknowledge the learning styles and standards of the 21 st century learner and should teach accordingly. Schools and districts should provide more effective educational technology staff development programs that provide ample support and encourage teachers to integrate the technology in the classroom. 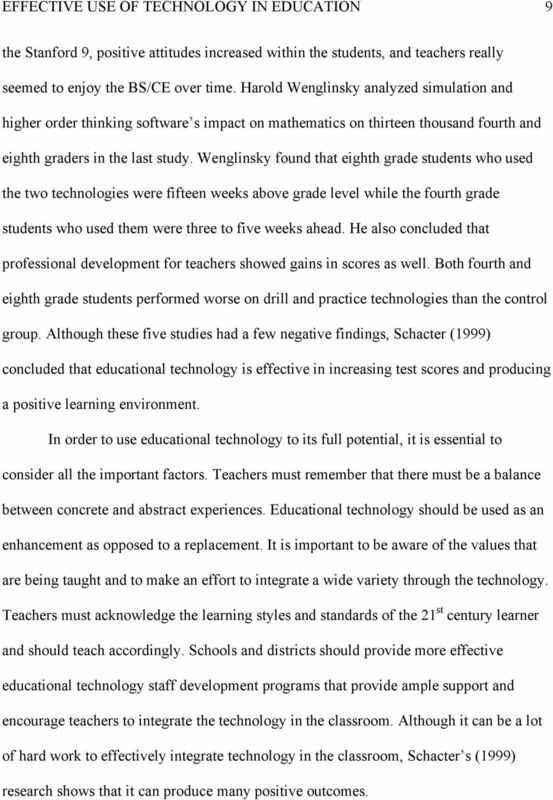 Although it can be a lot of hard work to effectively integrate technology in the classroom, Schacter s (1999) research shows that it can produce many positive outcomes. 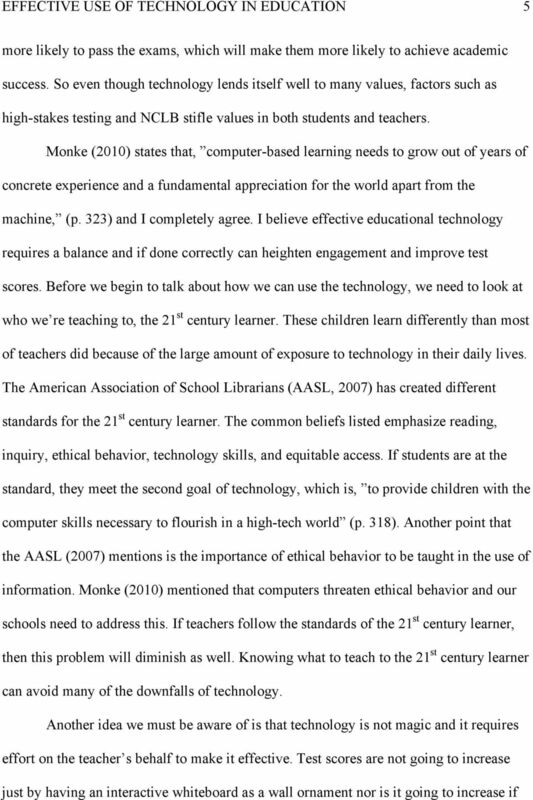 10 EFFECTIVE USE OF TECHNOLOGY IN EDUCATION 10 References AASL. (2007). Standards for the 21st Century Learner. American Library Association, 1, 1-8. Brand, G. A. (1997). 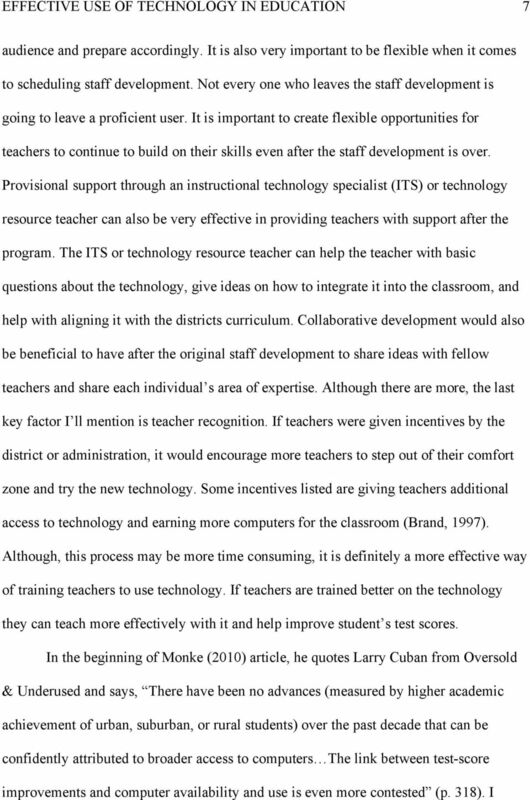 What Research Says: Training Teachers for Using Technology. Journal of Staff Development, 19(1), 1-9. Retrieved July 28, 2011, from the Google Scholar database. Lin, P. (2009). 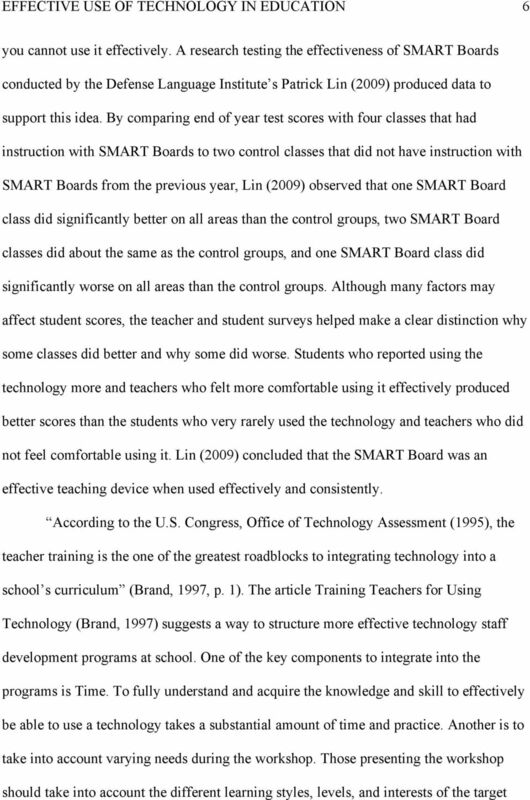 Is SMART Board Smart Enough to Raise Students Proficiency Level?. DigitalStream Proceedings, 0(0). Retrieved July 31, 2011, from Monke, L. (2010). The Human Touch. Taking sides: clashing views on educational issues (16. ed., pp ). Boston: McGraw-Hill Higher Education. Peterson, R. E. (2001). Establishing the Creative Environment in Technology Education: Creativity Doesn't Just Happen by Chance; the Prepared Environment Nourished It. The Technology Teacher, 61, 1. Pratt-Dawsey, C., & Tanner-White, K. (2011, July 27). Survey: Nearly 30% of Michigan teachers report pressure to cheat. Detroit Free Press. 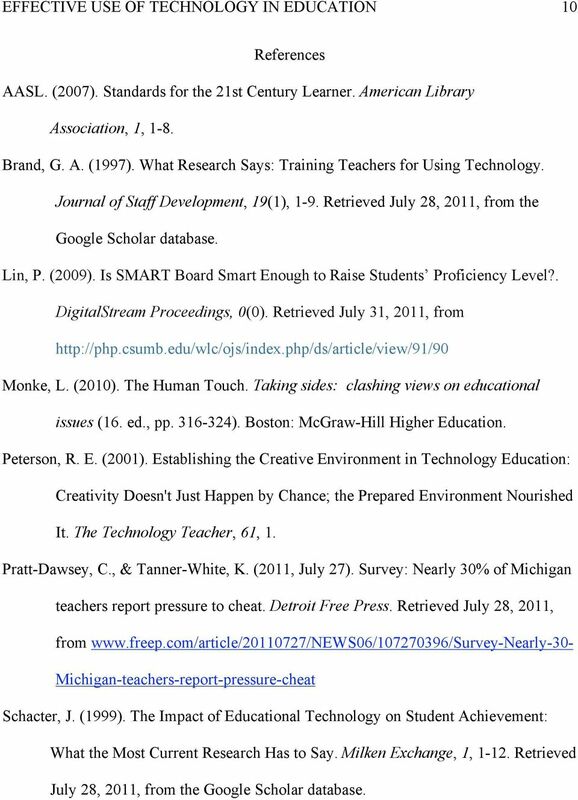 Retrieved July 28, 2011, from Michigan-teachers-report-pressure-cheat Schacter, J. (1999). 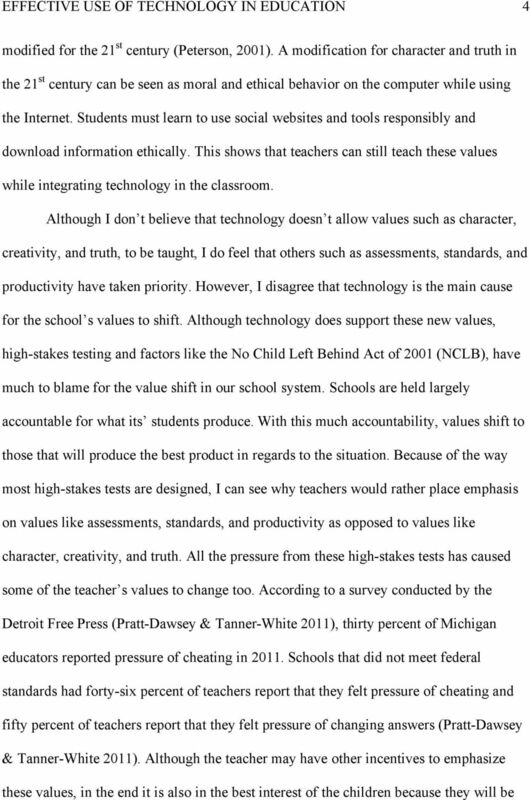 The Impact of Educational Technology on Student Achievement: What the Most Current Research Has to Say. Milken Exchange, 1, Retrieved July 28, 2011, from the Google Scholar database. In society today, technology, education, and economic growth go hand in hand. Integrating Technology into the Classroom Trevor Moore Western Oregon University ED 633 Introduction Integrating the use of technology into everyday lessons can be very beneficial for student achievement. Project-Based Learning for all students entering Kindergarten to Grade 12. Used by Missouri school districts since 2000! New STEM. Courses for 2016! 29. What are your greatest strengths as a teacher, and how did Purdue's Teacher Education Program contribute to the development of these strengths? MO DEPT ELEMENTARY AND SECONDARY EDUCATION SCHOOL YEAR: 2009-2010 DISTRICT: 061-150 ATLANTA C-3 BUILDING: 4020 ATLANTA ELEM. FINAL REPORT 2005 08 RESEARCH GRADE 7 TO 12 PROGRAMS. Frontier College would like to thank the Ontario Ministry of Education for their support. for LM students have apparently been based on the assumption that, like U.S. born English speaking children, LM children enter U.S.
Literacy is found in all content areas. Therefore, we think it is important to address literacy through the lens of an English Language Learner. On-line Tutoring and Students: Measuring the Efficacy of Tutoring and How it Affects Completion Rates of Algebra Students.